Studio Pack presents its innovative products. 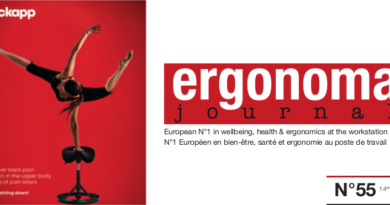 Ergonoma Journal (European quarterly) already selected since his N° 38 these two support products for acoustic ergonomic workspaces. Versatile and compact product, Silence Sound Center is easily movable due to its size and weight (1m2 of floor space and 80kg). It requires no special installation. An electrical outlet is sufficient. Equipped with a 220V socket on the side, it will allow you to recharge the batteries for your connectable devices. This chair also has a universal charger for smartphones / tablets. Supplemented by a support table and a high performance sound system, it is ideal to isolate yourself, work, listen to music, make phone calls, to be video conferencing. or discuss with people discreetly. The sound is kept inside the Silence Sound Center. Optional: adjustable LED reading lamp and RJ45 socket. Several put together, these chairs are a full new connected space, dedicated to working comfort in coworking. VISIOOBOX design Antti Evävaara (Finland), individual and versatile solution: connection and interactivity. However, the first principle of this solution is based on the connection. The cabin is the smallest meeting room in the world. Therefore, also equipped with a sound system and a screen, these allow you to work and be videoconferencing with colleagues, wherever one is, in a unique privacy. The dual ventilation system available to the VisiooBox ensures a constant renewal of the air. Its two sockets allow you to charge your devices and laptop. A charging cable will also charge your smartphone. An electrical outlet and an Internet connection with Ethernet is enough. Which allows to develop very quickly and easily videoconferencing space according to the available space and your needs. No more videoconference rooms complicated to set up and quickly monopolized. So many technologies that can be added inside this cabin to make it more interactive and connected , following requirements.